A salute to our wonderful CSA subscriber/clients and their culinary creations. 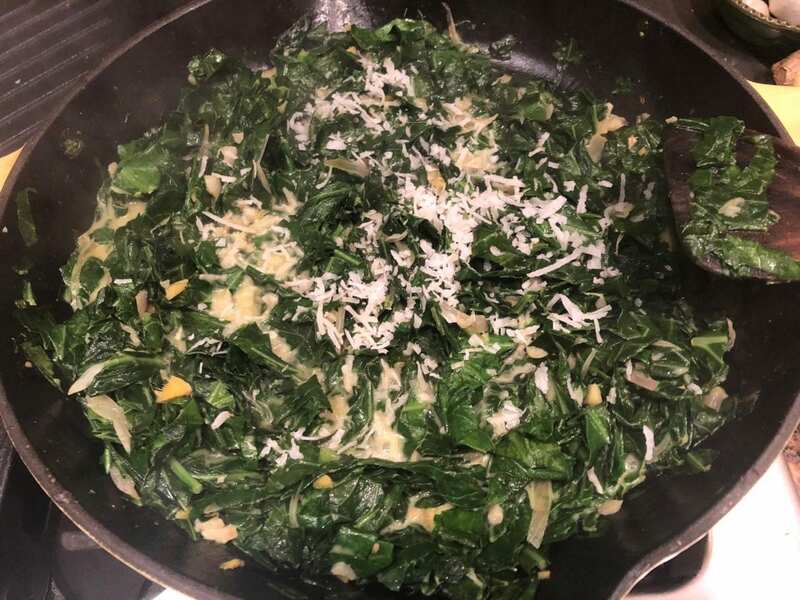 From one of our favorite new subscribers, this dish can be made with our collard greens, our kales, our spinach, our turnip and mustard greens, OR, a nice combination thereof. Elizabeth sent us this picture illustrating the classic collards preparation. It makes about 4 servings. She also made a beautiful salad with our Salad Mix and Microgreens, but spiffed it up even more with walnuts and sliced Fuyu Asian persimmon slices. Wow. Elizabeth used a large cast iron skillet which is ideal, but any large metal pan will do. I bet you could even use a stock pot if you had to. Pre-heat the pan on medium then add the coconut oil, shallot, garlic and ginger and sautee (but do not burn!) for just a couple minutes. Add the greens, a bit of Kosher salt, the curry powder, and the coconut sugar. Mix and sautee for 2 minutes and cut the heat down a little. Cook another 3 minutes until greens are tender. If you want to add Kale, Spinach, or even our famous turnip and radish greens, do it now and sautee with the collards for just 3-4 more minutes. Salt and Pepper as needed and serve in the cast iron pan as Elizabeth did. We have to include the picture Elizabeth sent us of her salad below. It’s gorgeous. 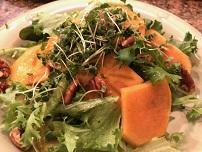 She used our Salad Mix and Microgreens, but embellished it with some awesome Fuyu Asian persimmon slices and walnuts. She didn’t mention a dressing, but our greens are right out of the field, so I’m guessing it’s just a good, clean basic vinaigrette.